The City of Madison, population 4,000, is the county seat of Morgan County, Georgia, 60 miles east of Atlanta. It was not destroyed in the Civil War and retains over 100 antebellum homes. Madison’s 2004 Comprehensive Plan contains policies that promote the adoption of a TDR Program to permanently preserve open space and greenspace, create opportunities for passive recreation and preserve environmental quality. In 2009, Madison adopted a Greenprint Addendum that identified resources deserving protection. In 2011, the Madison City Council adopted a Downtown Urban Redevelopment Area (DURA) plan that identified TDR as an implementation tool. In May of 2014, Madison adopted a TDR ordinance designed to preserve natural areas, riparian corridors, greenspace buffers, agrarian landscapes, trails, gateways, historic landmarks and recreational sites as well as concentrate development close to infrastructure, services and amenities as envisioned within the three plans mentioned above. Madison allows TDRs to be severed and sold from city-owned parks as long as the proceeds are reinvested in further preservation. Parcels qualify as sending sites in any of the following three ways. a) Located within six residential zoning districts or the Professional/Limited Commercial District (P2). b) In or near a gateway identified in the DURA. c) Identified in the Greenprint as natural area, habitat, riparian, greenspace buffer, agrarian landscape, trails, gateways or recreation sites. 2) Any city-owned parcel meeting a 1c criterion from above. 3) Any landmark listed in the Greenprint and registered as a Landmark by the Madison Historic Preservation Commission. The ordinance states that TDRs from City-owned parks and greenspace must be deposited in the TDR Bank and that the “further conveyance” must be used to protect additional land meeting the 1c criterion from above. TDRs available to a residential sending site are calculated by dividing the gross lot area by the minimum lot size of the applicable zone. P2 parcels can generate TDRs at the ratio of four units per acre. The ordinance provides detailed procedures for transferring TDRs including the requirement that a deed of transfer contain a metes and bounds legal description of the sending parcel, survey, serial numbers and copies of a TDR certificate for each TDR being transferred, a copy of the recorded conservation easement and the names/addresses of the grantor and grantee. Receiving parcels must meet all three of the following criteria. 3) Within 2000 feet of a neighborhood center, within 1500 feet of a neighborhood park and within 1500 feet of an arterial street or state highway. One TDR is required for each dwelling unit above baseline and the maximum average density achievable by TDR is 16 units per acre. The ordinance permits the formation of a Land Bank to encourage the use of TDR and leverage public funding for conservation purposes. The Bank would be able to buy either TDRs or property in fee simple. When accepting or conveying TDRs, the ordinance states that the Bank may determine TDR value using negotiation, a competitive bid process, or any other method reasonably deemed fair and equitable by the Bank Board. In a July 22, 2015 phone call, this program’s first transaction was reported by Christine McCauley, the Madison-Morgan Conservancy’s Executive Director, who promoted and piloted the evolution of this program for over a decade. The sending sites are all publicly-owned properties including cemetery land, existing park land and parcels owned by the City’s Downtown Development Authority that will be developed as public greenspace. 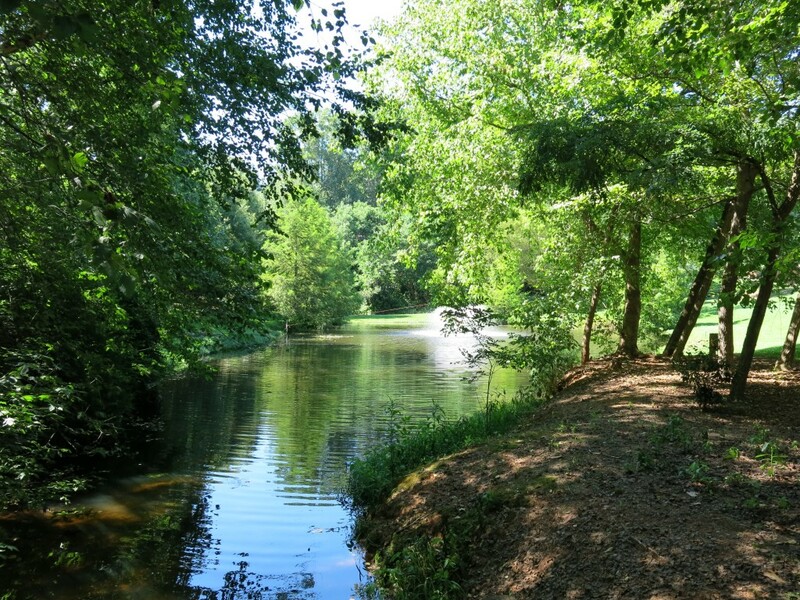 The conservation easements are held by the Athens Land Trust with financial assistance from the Riverview Foundation for the $5,000 endowment cost per easement. The public sending site owners sold 36 TDRs from these sites for about $6,000 each. The receiving site is an age-restricted project named Silver Lakes Court, which bought 32 of the 36 TDRs. As of July 22, 2015, the project was approved and the TDRs needed for the bonus development were documented as retired. The City’s Greenspace Commission will sell the remaining 4 TDRs and will take the proceeds from all sales to preserve future sites as required by the ordinance. With the success of this transaction, the City may consider expansion of what is now an admittedly small receiving area.